RP Photonics has a deep expertise on different mode-locking techniques, types or designs of mode-locked lasers, etc., and also has powerful numerical software for designing and optimizing mode-locked lasers. The general aspects of the generation of ultrashort pulses by mode locking are discussed in the article on mode locking. This article addresses active mode locking, which involves the periodic modulation of the resonator losses or of the round-trip phase change. This can be achieved e.g. with an acousto-optic or electro-optic modulator, a Mach–Zehnder integrated-optic modulator, or a semiconductor electroabsorption modulator. If the modulation is synchronized with the resonator round trips, this leads to the generation of ultrashort pulses. Figure 1: Schematic setup of an actively mode-locked laser. A pulse with the “correct” timing can pass the modulator at times where the losses are at a minimum (see Figure 2). It is thus favored against any other radiation circulating in the resonator. As the pulse will in the steady state saturate the laser gain such that its round-trip gain is zero, other circulating radiation will have a negative round-trip gain and will thus die out sooner or later. Still, the wings of the pulse experience a little attenuation, which effectively leads to (slight) pulse shortening in each round trip: The round-trip gain is slightly negative for the wings and slightly positive for the pulse center. As a result, the pulses get shorter and shorter, until the pulse shortening is offset by other effects (e.g. gain narrowing or chromatic dispersion) which tend to broaden the pulse. 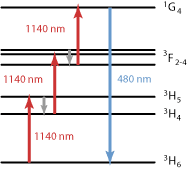 Figure 2: Temporal evolution of optical power and losses in an actively mode-locked laser. The modulator causes increased losses for the pulse wings, effectively shortening the pulses. As the pulse duration relative to the pulse period is typically much smaller than shown, the pulse-shortening effect of the modulator is usually very weak. In simple cases, the pulse duration achieved in the steady state can be calculated with the Kuizenga–Siegman theory; it simply results from the balance of pulse shortening in the modulator with pulse broadening by gain narrowing. The pulse duration is typically in the picosecond range and is only weakly dependent on parameters such as the strength of the modulator signal. This weak dependence arises from the fact that the pulse-shortening effect of the modulator rapidly becomes less effective for shorter pulse durations, whereas other effects which lengthen the pulse (e.g. gain narrowing and chromatic dispersion) then become more effective. Somewhat less obviously, active mode locking also works with a periodic phase modulation (instead of amplitude modulation) e.g. in a Pockels cell, even though this leads to chirped pulses. This technique is called FM mode locking (FM = frequency modulation), although the term phase modulation mode locking would seem to be more appropriate. 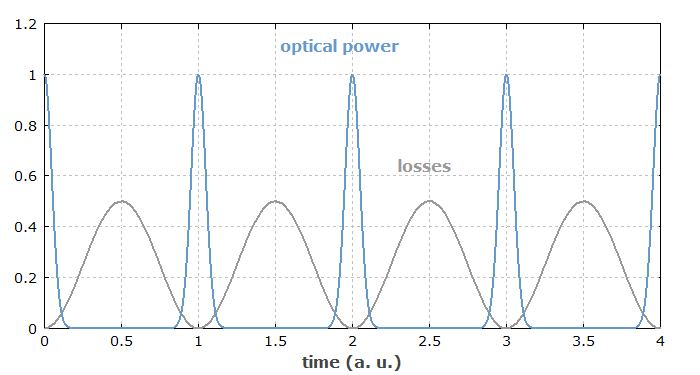 Some FM mode-locked lasers exhibit an instability: they exhibit random hopping between two operation modes, where the pulses pass the modulator at times where either a minimum or a maximum of the phase delay is reached. This kind of bistability is sometimes removed by dispersive and nonlinear effects. For stable operation, the round-trip time of the resonator must fairly precisely match the period of the modulator signal (or some integer multiple of it), so that a circulating pulse can always pass the modulator at a time with minimum losses. 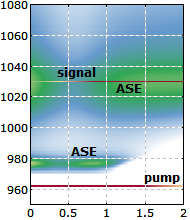 Even a small frequency mismatch between the laser resonator and the drive signal can lead to a strong timing jitter or even to chaotic behavior, since the obtained “pulling force” on the pulse timing is quite weak. Synchronization between the modulator driver and the laser can be achieved either by careful adjustment of a stable laser setup, or by means of a feedback circuit which automatically adjusts either the modulation frequency or the length of the laser resonator (and thus its round-trip time). A frequently used technique is regenerative mode locking (also called mode locking with regenerative feedback) . Here, the modulator signal is not generated by a free-running or slightly corrected electronic oscillator, but rather is derived from the detected intensity modulation of the pulse train itself. Such schemes are particularly important for achieving tunable pulse repetition rates, and are often applied to mode-locked fiber lasers and laser diodes. Due to geometric constraints, it can be difficult to reach very high pulse repetition rates by making the laser resonator very short. A solution can be harmonic mode locking, where multiple pulses circulate in the laser resonator. The modulator frequency is then an integer multiple of the round-trip frequency. A variation of the method is rational harmonic mode locking, where the modulation frequency is the round-trip frequency times the ratio of two integers. Compared with passive mode locking, active mode locking typically generates longer pulses. A disadvantage is the need for an optical modulator, the electronic driver and (in most cases) means for synchronization (see above). On the other hand, active mode locking can be the natural solution when pulse trains are required which are synchronized with some electronic signal, or when many lasers need to be operated in synchronism. Therefore, active mode locking is often used in the context of optical fiber communications.